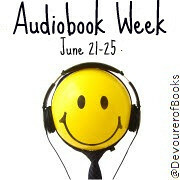 Jen over at Devourer of Books has created a lot of great events and giveaways for audiobook week and I feel obliged to participate as I am a huge proponent of audiobooks. Today's discussion topic: why audiobooks? I started getting heavily interested in audiobooks four years ago when I accepted a job almost an hour from my house. To keep myself from going insane while sitting in traffic, I began to check out audiobooks at the library, and the rest is history. I always encourage my students to listen to audiobooks, even when their parents will tell them that it's cheating. Listening to audiobooks is a different experience from reading a book, but no less valid. I'm the type of person who prefers audiobooks to regular books and vice-versa, depending on the book. I have abandoned audiobooks that were absolute snorefests thanks to dull and lifeless narrators, but then read the actual book and loved it. If you haven't listened to an audiobook, this is the week to give them a try. Good post and possibly a very good way to get students like you said to get into reading. Diane, I love listening to audiobooks while I'm doing other things: making dinner, walking the dogs, cleaning the house... it's such a great way to use up that empty space. Sheila, unfortunately, I haven't really been able to get many kids into trying out audiobooks (at least that they tell me). Even though I'm always telling them that it's no less valid than reading a book, many of them still think it's "wrong" or that it's just reserved for "learning disabled" kids. I tried getting my sons to listen to Call of the Wild on a recent trip but it did not fly - I enjoyed it though!